Getting the right type of lighting to illuminate your property once its night time is a great way to accentuate the beauty of your premises. Electrics on Tap has available a wide range of lighting options we can install to brighten your exterior property once it gets dark. We can install cost-effective lighting options such as LED lighting that will provide the perfect amount of light without consuming too much electricity. This guarantees your property is properly illuminated and beautified at less cost. We can also help you install sensor lights that only power on when the sensors are triggered on by movement in your garden or anywhere else outside they are installed. 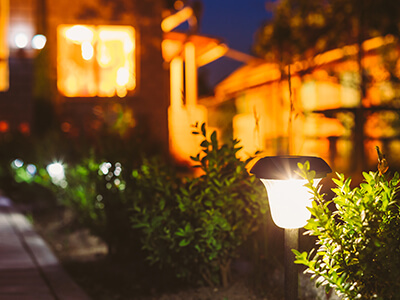 Not only are our sensor lights a cost effective lighting solution, they are also a great security feature that will alert you at night if ever a trespasser crosses into your yard. Call us today on 01273 723 600 to discover what wonderful lighting options we can make available for your home as well as a free quote. Outdoor wiring for your garden appliances. Electrics on Tap can ensure that when enjoying your yard or garden, you don’t have to worry about going into your home to get an extension cable for electricity outside. Not only is this stressful, it is also risky because anyone can easily trip over such an extension’s wires. Our experts can help you install electrical sockets at strategic locations of the outside of your home in order to guarantee that you can access electricity anywhere outside you need it. We provide this service with the safety and comfort of your home in mind and is why we make sure none of the wiring for such a job is visible by the time we are done. 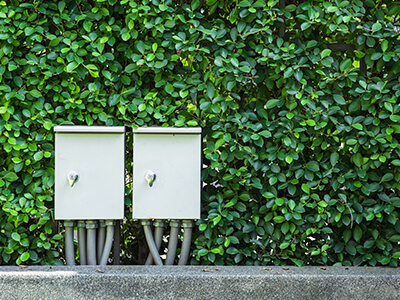 All wiring for the installation of outdoor sockets will be safely tucked out of sight and guarantee you have access to electricity wherever you need it outside. Because such sockets will be exposed to various weather elements, we ensure to use only the most reliable products from market leading brands to guarantee that our installed solutions will last for years to come. Let Electrics on Tap make your garden and compound stand out at night by installing the latest LED lighting to illuminate your premises. This will improve your home’s security as well as beautify it in several ways. And all of it can be achieved with a budget friendly electrical solution from us. With our expert services, the outdoors of your Brighton home can become an extension of what you enjoy indoors. We can discreetly wire your garden to provide outdoor sockets for outdoor entertainment or power to use work appliances or water features. Get in touch with us today on 01273 723 600 and we can have one of our expert electricians stop by at your property whenever is most convenient for you to give professional advice or provide the services you need. Whatever your outdoor electrical needs are in Brighton, Electrics on Tap is at your service. Would you like to make your garden stand out in the summer night, put the latest LED lighting in your decking or simply add security lighting to your home? We can inform you of the options available. Learn to think of your outdoor space as an extra room . Do you require outdoor sockets for garden entertainment or power to your water feature, electric gates on your driveway or simply a place to plug in your radio in the potting shed? 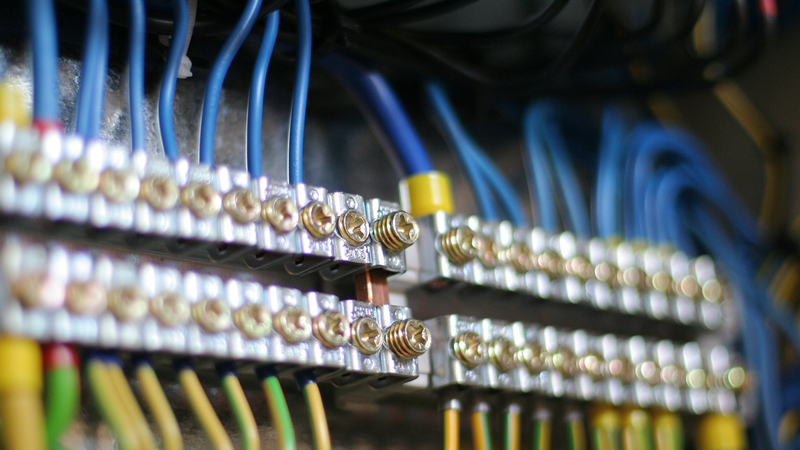 Get in touch to arrange one of our electricians to come round and give you advice and quotes. Electrics On-Tap is proud to offer Outdoor/Garden Appliances services in the town of Brighton, which lies within South East England in the county of East Sussex. A range of East Sussex businesses including Electrics On-Tap make their home in Brighton. Electrics On-Tap’s Outdoor/Garden Appliances service area like-wise encompasses Moulsecoomb, Hollingbury, Hollingdean, Hove and Mile Oak in the City of Brighton and Hove. Last in order but nevertheless important, Electrics On-Tap’s Outdoor/Garden Appliances services cover the Brighton Municipality including Brighton Marina, Stanmer and Bear Road area.